Sometimes when working on a project, it can be really easy to get swept into the tide like a lost and flowing bouquet of seaweed. If you work at a good agency, however, there are some variables that are absolutely critical to keep in mind when going through the design process. 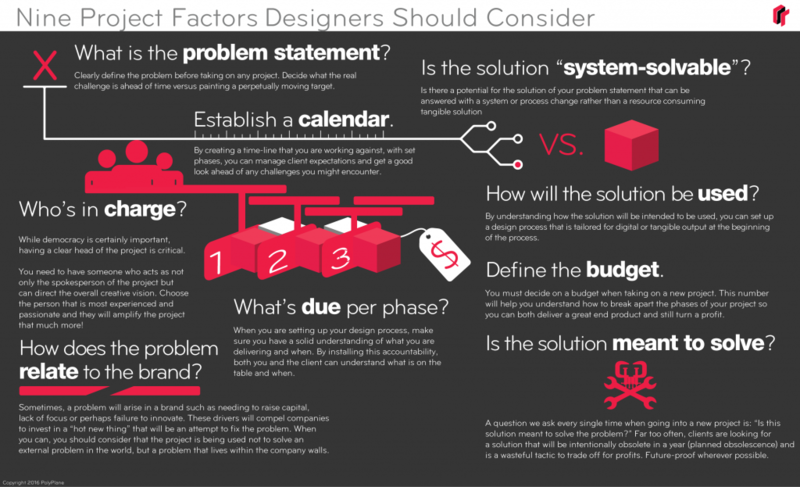 You can consider this a shortlist of the many many variables that are involved with the typical design problem. We chose these because they are probably not always the top-of-mind when diving into the project. The single biggest downfall of a project when in development is not having a clear and well defined problem statement. Before a question can be answered, it needs to be asked. This is where our problem statement comes in. Usually the problem statement is a simple sentence that has a clear problem and if you’re luck an even clearer goal. Great problem statements are the result of the distilling down a slew of input from either clients, customers, coworkers, or whomever your dissatisfied grievance generator is. The wonderful thing and simultaneously horrible thing about design challenges is that if you have infinite time (and infinite budget) your solution will never see the light of day. There’s no reason to start. A great reference of this is Parkinson’s Law. So by clearly defining the end date, you can use what is called a “work back schedule” to systematically work back from that date to determine how your schedule will break out. Once you have a good sense of how long each phase of the program will last, you can put it into the calendar and determine how quickly things will come together. Using a little pressure on your team or just yourself will yield better results with faster output. The key is to schedule phases within phases that make the work more manageable and easier to complete. At CCD, we break these into four distinct phases as seen here. While democratizing design is important, having a clear captain of the project is absolutely critical. You need to have someone that owns the project. This means you need someone that can make the judgement of whether or not the problem statement is being answered correctly. This person also is tasked with identifying the best people for each job in a project. This can include design, project management, engineering, research, etc. Just so long as the ship has a rudder and someone at the helm. What happens if no one is in charge? You’ll wind up with people duplicating efforts, a misalignment of understanding of each phase, and a final result that looks like multiple chefs were making multiple cakes and piling them onto one plate. Have a leader on your projects and they will go further. What is due per phase? Much like the importance of the calendar, the items due per phase is exceptionally important in that they set the expectations of your client and give your team accountability. You wouldn’t put the wheels on the car before the frame is designed. Likewise, you wouldn’t show prototypes without showing research to back them up. You need to do things in an order that shows each phase informing the next. If you agree to 3-5 concepts shown in the concept development phase, you better come with no less than three! Your being paid for these deliverables, therefore, you can use a creative estimate/proposal to define the deliverables at each phase (and develop a calendar at the same time). How does the problem relate to the brand? A lot of companies hire you to figure out how to design an X. In this case, “X” is whatever product or system they want designed to solve the problem statement. Sometimes these problem statements reflect an issue that is inwardly facing such as a company that wants a new design that is going to fix their brand. At that point, it is treacherous ground that you’ll be standing on because the problem might actually be caused by something the company is doing. This could be a cultural thing, a misalignment with a demographic, or perhaps the company is just not understanding their own reason for being. Be wary of companies that want to throw a design at their customers because they think money is going to be what solves their problems. In reality, they may have a larger problem that requires a business consultant to come in and fix things from the inside out. A big big thing for CCD is finding ways to reduce material in products and ask why the solution needs to be tangible in the first place. A lot of times, you can solve a problem by just changing the way you approach the process. Sometimes this is stunted by technological limits and sometimes it is cost prohibitive in the beginning, but certain companies have found that by looking just a little harder at their problem, they can find a change in their process that not only solves the problem, but saves them thousands of dollars in product development. How will the solution be used? Knowing the context of the solution before you even start a project is important. Say you have a product that is going to be used in a digital format only on the web. You immediately know that you’ll need to research into how that webapp is going to work on those platforms. Contrast that with a power tool that is going to be used in a warehouse, you’ll be looking at a very different set of information that helps define your concepts. Much like the calendar, a budget needs to be in place as this will define, timelines for development, materials and processes used, as well as money set aside for marketing and everything else. If a client comes to you with no budget and wants you to take a wild guess, always help yourself by aiming really high. Using logical extremes will give your client the sobriety (in most cases) that maybe 100k is a little more than they were expecting to spend. Sometimes your client may have an idea of the budget, but don’t want to share it because they want you to low-ball yourself so they save some money. Our typical strategy to contend this is to be as honest as we can be with the information we have, come up with a creative estimate that answers everything that will need to be involved with the program and then when it comes back as “too high” , show them why each and every step of the process is critical to the solution. This way you can trim back the amount of deliverables versus individual steps. They will get what they want from the program and you’ll save yourself a little time. Is the solution meant to solve? The most important thing outside of contextualizing the solution is understanding whether or not the solution your being asked to provide is actually meant to solve the problem or if it is just a bandaid that will get changed out down the road. The reason this is so important is that this is exactly what planned obsolescence is meant to do. While innovation of technology is happening all day/every day around us, products can’t always be future-proofed, ergo, this year’s hot new cell phone will be last years passé technology. Apple has turned this product cycling into a science. By staggering their product launches throughout the year, there is a built in disatisfaction that consumers feel that keeps them ever so slightly perpetually out of style…unless, of course, they pony up the next $400-$1200 for that watch, phone, or laptop. If you can take on meaningful projects that truly answer a problem, you’ll find more depth and helpfulness in the projects that you take on. By the way, are you on Twitter or Facebook? Yeah? Us too! Follow us for regular content on design theory, ProTalks, and technical videos that will give you even more ways to #beabetterdesigner. Stay tuned!